Members of the public are invited to join a few hundred of their closest friends to lend their voices to Handel's epic "Messiah" as part of a traditional Christmas event hosted by St. Scholastica at 7:30 p.m. Dec. 11, in the Mitchell Auditorium on campus. This marks the 38th time the College has hosted this event. 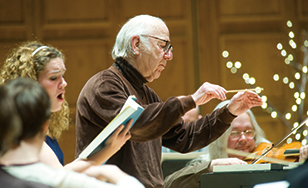 The St. Scholastica Center for Early Music Orchestra, under the direction of music department emeritus faculty member Shelley Gruskin, will provide accompaniment as audience members provide the vocals. There is no admission charge for this event. Participants may bring their own music score or purchase one at the door for $15. For more information, contact the Spotlight Box Office at (218) 723-7000, spotlight.css.edu or spotlight@css.edu. O Holy Night Concert, 7:30 p.m. Dec. 14 and 15 at the Cathedral of Our Lady of the Rosary, 2801 E. Fourth St.